From Athena to Zeus, you can create a bevy of easy-to-put-together costumes straight out of Greek mythology. Whether you are making a fanciful costume to wear to a dress-up event or constructing a pint-sized outfit for your little one's Halloween celebration, making your favorite character featured in ancient tales doesn't have to be difficult. Although there are an array of colorful characters to choose from, some figures from Greek mythology may lend themselves to an easier costume-making experience. For example, gods and goddesses that feature well-known symbols, such as Poseidon and his trident or Zeus and his thunderbolt, will require slightly less work than a lesser known deity. Most god or goddess costumes can start with a simple, traditional white Greek toga-style garment. Simply wrap a bed sheet around your body and over one shoulder. Secure it in the middle with a gold belt or a metallic braided piece of rope. Don a pair of sandals and add in a matching prop. The Olympian gods and goddesses aren't the only figures from Greek mythology to choose from when creating a character costume. Think outside of the pantheon of human form costumes and try one of ancient mythology's fanciful creatures. Although favorites such as the pegasus or centaur may be the ultimate in creative costumes, these selections will be quite time consuming and technically difficult. If you are looking for a simpler creature to use, try a Cyclops or a Medusa-like gorgon. These creatures are basically human, making it easy to use a Greek-style bed sheet toga for the main part of the dress. Simply add on a large painted eye in the center of your forehead to create the dramatic make-up of the Cyclops, or a wig intertwined with faux plastic snakes for a gorgon creation. Making a Greek mythology costume can be as simple or complex as you want. For an easier version, start with household materials such as bed sheets for togas. Look around for pieces of your own clothing to incorporate into the design. 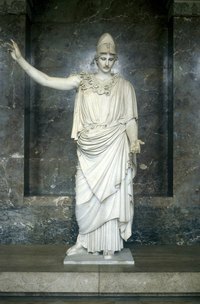 Those stylish gladiator-style sandals that you bought last summer will work well for the footwear of a goddess, while your metallic belt is an easy way to cinch off our child's Athena costume. Find additional items for props or decorative touches at craft or dollar stores. For example, instead of buying a fancy premade Medusa wig from a costume retailer, create your own by gluing a pack of dollar store kids’ toy snakes to an inexpensive Halloween wig. The right props can complete your mythological costume look. Think about what symbols or imagery are traditionally linked to your chosen character. If you are dressing as a god or goddess, look for key items mentioned in the myth itself. Make your own props out of cardboard, construction paper, foil and paint. For example, create a shield for Athena, the goddess of war, by cutting a circle out of the side of a reused cardboard box. Cover the sphere with foil and attach a cardboard rectangle across the back as a handle.